Smartphones are here to stay. Smartphones are radically changing the way we live our lives. Smartphones are causing different health crises, most of which remain under the radar until they seemingly emerge out of nowhere. The headline below speaks directly to two different health concerns which are becoming more pervasive and serious by the day. Those two health problems are posture and addiction. If you use a smartphone, consider for a moment your posture when you’re focused on the small keypad. Think about how often you assume this posture. And then contemplate that this may be your predominant posture toward life … toward the world … toward your job. The longer we maintain an ergonomically incorrect posture, the quicker the body will react with some form of compensation. Usually that means either neck pain or back pain. And usually we fail to make the connection because who would relate the overuse of a smartphone, tablet and laptop to a lower back pain. Like we said, compensation —> wherever it decides to show up in your body. So profoundly has the smartphone affected society that now many have literally become slaves to a technology which can wreak havoc with so many aspects of the physical body. The EMR output of these devices is of particular concern. 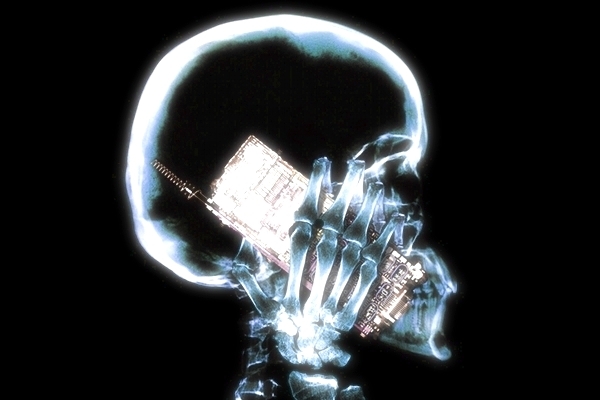 The more powerful that smartphones become, the more electromagnetic radiation goes into the head. Especially for those who are connected for an inordinate period of time do we see many of the symptoms associated with EMR poisoning. What are those symptoms? What does it mean when one’s childhood playing in the woods or on the soccer field is instead spent married to a smartphone or ipad? Such a predicament of growing up in 2012 translates to many serious health conditions at earlier ages. It also means the lost opportunity of having a ‘normal’ childhood, if such a thing even exists anymore. One childhood is history, it’s gone and therefore many unique opportunities that only exist for the young have forever slipped away. By allowing our children to grow up in such a natureless vacuum and technological cocoon, we all but guarantee their stunted development across many important aspects of real life and other practical disciplines. By turning them into screen slaves so early in life, we also guarantee a life of ailments, both physical and mental in nature. Emotional development is also sure to suffer as we see it all about in today’s society. Severe psychological conditioning on a virtual and subliminal level also creates a set of very serious social problems. The kids relate to technology, not each other. The language becomes a string of soundbites, not expressions of heartfelt emotion and rational thought. This aspect of the information age is particularly concerning because of how it has dulled the conscience of the entire civilization. Social graces are practically non-existent. Real community has disintegrated, Constructive dialogue is missing when it is needed the most. Yes, we are all much more aware of the problems, but the solutions remain elusive because it is always mediated by the prevailing technologies of the Information Age. Do you really want a Smartphone next to your head so often? The most serious health crisis in store for the younger generations, who are wedded to this information technology, will occur in a manner that is both subclinical and elusive. The still-developing brain is being exposed to powerful radiation from a device that is a receiver vis-a-vis a cellphone tower. Perhaps most do not truly understand what this means, especially when the entire head is now acting as a receiver of sorts. If you happen to adorn yourself with a lot of metal jewelry, or have numerous metal tooth fillings (or metal implants) or wear metal frame glasses, you are ramping up the effects of that EMR output. Not a pretty picture as the one above attempts to dramatize. As computing technology becomes more advanced and compressed, we are seeing much more capacity shrunk into smaller spaces. Therefore, the smartphone of today possesses an enormous amount of power and capability. That capability does not come without more energy being routed through the device. Particularly when the phone is used against the ear does this cause major problems. Likewise, using laptops on one’s lap or ipads cradled by the arms certainly sets one up for a steady dose of harmful EMR output. Simply put the human body has it’s own bio-electrical field that is being short-circuited every time these devises are introduced into the bio-field. Naturally the closer to the body, the longer the duration of exposure, the more intense the EMR output, the more injury to the impacted tissues will occur. In case you are unaware of some of the science, here are a couple of links which might edify. In the event that you suffer from chronic insomnia, as so many smartphone users do, the following article will shed further light on the matter. Now we know that many will resist this guidance. In fact many are completely addicted to their technology. Stone-cold addicts of the first order. And there’s no changing their techstyle in this lifetime. In these cases we strongly recommend implementing any measure that can substantially mitigate any of the problems described herein. For instance, utilizing Bluetooth is far preferable to no wireless technology in the context of all cell phone and smartphone usage. It’s way, way better for the body to use Bluetooth whenever possible. There are also a variety of EMR reduction chips on the market which are said to appreciably decrease the exposure. These do come in many shapes and sizes so we do advise caution in that you want to make darn sure that the chip is doing exactly what they say it does, yes? Don’t accept any of the claims at face value. And do triple due diligence on any and all products/technology which you might consider. Especially the more addicted you are to this smartphone. Lastly, for those who know they suffer from an addiction, as intimated in the leadoff article, you might want to consider the following two health coaching sessions. Each of these conveys critical perspective on overcoming the challenges, particularly for those who have broken through the denial phase. Are Your Addictions Getting The Best Of You? In closing we leave you with a picture that is worth a thousand … no, ten thousand words! Please click on this thermographic image to enlarge so that the descriptions can be properly read. Need we write any thing else on this subject? !